Images of Mohammed. Which to publish in tribute to Charlie Hebdo? Millions say: Je suis Charlie, I am Charlie. Freedom of speech, freedom of expression. Which image to publish in tribute to Charlie Hebdo? Millions say: Je suis Charlie. I am Charlie. 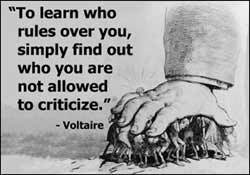 Freedom of speech, freedom of expression. What to publish? It's the principle of the thing, I have often heard. In this case, the principle is freedom of speech. In Quebec, Canada, all the major French-language newspapers jointly published a Charlie Hebdo editorial cartoon featuring the Prophet Muhammad, in a show of solidarity with the massacre at Charlie Hebdo: Le Devoir, Le Journal de Montréal, Le Journal de Québec, 24 Heures, La Presse, Le Soleil, Le Quotidien, Le Droit, La Tribune, La Voix de l’Est, Le Nouveliste and Métro. The message is clear: united we stand for freedom of speech. I am Charlie. Je suis Charlie. In the States, CitizenWarrior, always so reasonable, very reasonably asked: What is the only sane response to the massacre by Islamic terrorists of the 12 people at Charlie Hebdo? Their answer: everyone should publish images of Mohammed, the person considered a prophet by Muslims. And they took their own advice, published an image. I'm sure there's more than one sane response. I'm not for coercing people. But I have, once again, asked myself: should I publish an image? I don't believe we all need to come to the same conclusion. I do agree: united we stand. In World War II, in Denmark, the royal family declared that if Jews were required to have a large yellow Jewish star on their clothing, they would all wear one too. The Nazis backed down. United we stand. In the end, almost all Danish Jews were saved because Danish non-Jews arranged a nighttime evacuation across the waters to safety in Sweden. 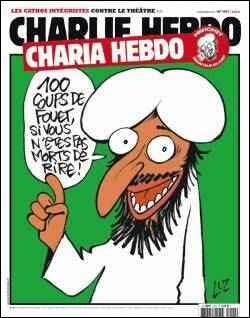 I suppose it would be great if every publication for freedom of speech and against Islamic terrorism published an image of Mohammed. 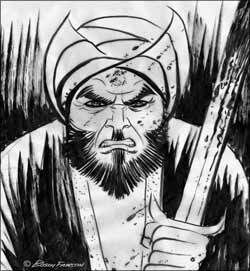 Anyway part of my tribute to Charlie Hebdo is to publish an image of Mohammed. That brings me to the question: which image? A bit too friendly looking for me. Plus I have no idea who that is. Is it supposed to be some random Muslim, or Mohammed? CitizenWarrior chose one by Bosch Faustin. Quite a menacing image. Below is the image I'm most drawn to publish. It includes the cartoon that was used to set off this particular stage of the jihad against the West, and it adds a vital message. When Muslims demand that we adhere to their standards, they do not even acknowledge that they are violating ours. Ok, that's them. But what about us? It doesn't make sense to violate our own standards and acquiesce. Instead, as the message says: it offends me when you spit upon the ancient traditions of my people. 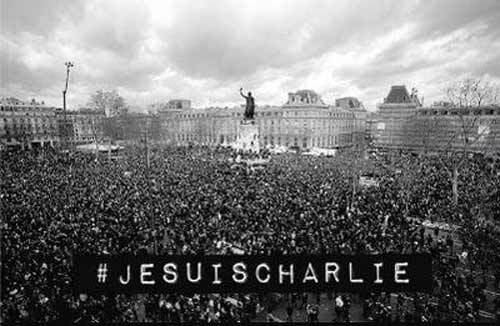 Millions say: Je suis Charlie, I am Charlie.